Smart investors always have a plan to prepare for a stock market crash. In fact, stock market crashes only devastating because most investors are rarely prepared for a major pullback. The stock market crash of 1929 wiped out 86% of the value of the Dow in just three years. But before the crash, the Dow had gained over 300% during the 1920s and economists were predicting that stocks could only rise. Famed economist Irving Fisher claimed stocks had reached a "permanently high plateau" in 1929, just over a month before the crash. Investors were similarly caught off guard in 2000 and 2008. The dot-com bubble popped in 2000, leading to a 14% drop in the Dow in just over a month and a 36% decrease before it began recovering. The Dow lost half its value during the 2008 stock market crash. If investors could've predicted the exact timing of these stock market crashes, then they wouldn't have been so painful. The 2008 collapse destroyed over $2 trillion worth of Americans' retirement savings. While these losses are staggering, they aren't a reason to flee the stock market and keep your money hidden under the mattress. Avoiding the market out of fear is actually one of the biggest mistakes you can make. At Money Morning, we believe you can control your financial future, and investing your money is the fastest route to financial independence. The Dow alone is up 228% since the recovery began in 2009, and investors who knew the right places to invest are up even more. Today, we're bringing you the strategies of four Money Morning experts to show you exactly where to put your money before the market crashes and what to do when the markets start falling. We'll also show you how these tactics would have performed during past market crashes, so you can see exactly why they are so effective. Owning gold is an excellent hedge against uncertainty in the stock market. Money Morning Executive Editor Bill Patalon says gold is a "good 'store of value' when uncertainty gets out of hand." "And we're definitely deep into what I refer to as the 'Era of Uncertainty,'" Bill said in March. 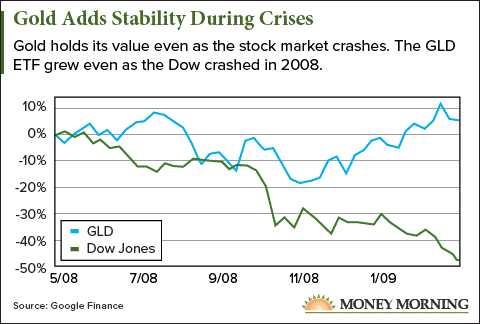 Between the start of the market crash in May 2008 and its end in March 2009, the Dow lost 49% of its value while gold prices actually rose over 5% in the same time. Money Morning Chief Investment Strategist Keith Fitz-Gerald says while gold's stability is a real asset to any portfolio, you don't want to overdo it and put all your money in gold. Keith says studies have shown that putting 2% to 5% of your investable assets into gold adds stability to your portfolio without sacrificing growth. First, gold buyers can always purchase physical gold in the form of gold bars or coins. Investors just need to make sure they are buying from a legitimate dealer and have the ability to keep their gold secure. In the second method, investors can buy a gold exchange-traded fund (ETF). Gold ETFs mirror the value of gold and can be bought just like any other stock. Keith recommends the SPDR Gold Trust ETF (NYSE Arca: GLD) for those looking for an ETF. "I recommend the SPDR Gold Trust because it's easy to own, liquid, and well-established," said Keith. A share in GLD isn't as expensive as an ounce of gold, but it gives investors the same benefits. For example, an ounce of gold currently sells for $1,249. That's an 8.7% increase over its price of $1,150 an ounce at the start of the year. GLD currently trades at $120.10 a share and is up 9.5% on the year. As you can see, GLD comes very close to matching the change in value of physical gold. Third, investors looking for more profit potential from gold can buy gold mining stocks. Because gold miners' revenue will rise as gold prices go up, owning gold mining company stocks gives you exposure to the precious metal. However, buying stock in a gold mining company is riskier than the other gold investing strategies because the stock could drop based on market events or poor business decisions. But investors with higher risk tolerance can seek out gold miners with profit potential. Bill recommends the Canadian "mining heavyweight" Goldcorp Inc. (NYSE: GG) for investors investing in gold mining stocks. "Goldcorp has consistently been one of the most innovative 'thinkers' in a business not often known for innovation," Bill said back in April. And Goldcorp is tapping into the power of the Watson artificial intelligence system, run by International Business Machines Corp. (NYSE: IBM). GG is using IBM's artificial intelligence system to help process geological data – including millions of core samples, seismic surveys, and theoretical modeling – to find the most lucrative areas to mine gold. "I love this strategy," said Bill, "because of its innovativeness, and also because it has both near- and long-term focuses." Shares of Goldcorp currently trade at $12.95, and analysts have one-year price targets up to $22 a share, a potential 70% gain. You see, a traditional short position requires the trader to sell borrowed stock and buy it back at a later date. If the stock's share price drops, then the trader makes a profit (they sold the borrowed stock at a high price, bought it back at a lower price, and pocketed the difference). But this strategy can be risky if the stock's share price goes up. While the lowest a stock can fall to is zero, there's theoretically no limit to how high it can climb. The biggest risk for a short seller is the stock's price rising, requiring them to repurchase the stock at a higher price than what they sold it for. There's no limit to how high their loss could be. However, shorting the market doesn't have to be this risky. Buying funds that short the overall market is a straightforward way to profit from a downturn without being susceptible to infinite risk. These funds are ones that go up when the stock market crashes. Money Morning Capital Wave Strategist Shah Gilani recommends investors turn to the ProShares Short Dow30 ETF (NYSE Arca: DOG) if they are confident a downturn is on the way. DOG trades inversely to the Dow Jones Industrial Average, so when the Dow dives, DOG goes up. Keith recommends a similar strategy, but instead of an ETF, Keith recommends the Rydex Inverse S&P 500 Strategy Fund (MUTF: RYURX), a mutual fund that trades inversely to the S&P 500. As the stock market falls, the share prices of these funds will rise, and as the stock market climbs, the share prices of these funds fall. There's no need to take a risky short position on an individual stock to profit from a market downturn. Even though DOG and RYURX aren't as risky as traditional short positions, they do carry some risk. If the market rises, the value of these funds will fall. But investors can still protect themselves in two ways. First, Keith says to use an inverse fund as a hedge. Buying an inverse ETF or mutual fund is a short-term play, it's not a "set it and forget it" strategy like buying gold. Investors can buy in when they're confident the market is about to fall or that it will keep falling. But once the market recovers, it's time to sell these funds. That also means not allocating more money to an inverse fund than you're willing to lose. For most folks, that will probably work out to less than 5% of your overall portfolio. 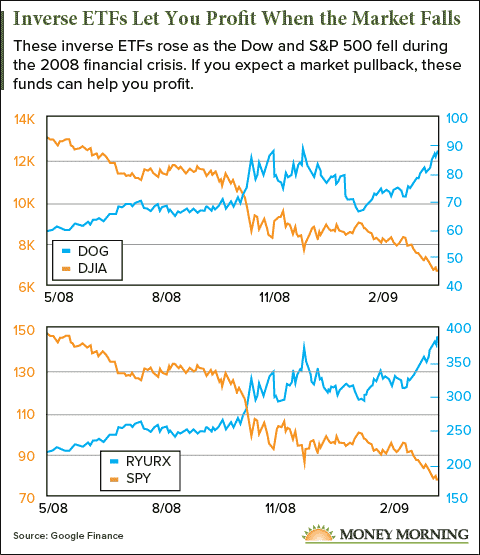 Using an inverse fund is simply a strategy to keep you profitable during a downturn or crash. Second, Shah recommends putting "stops" on inverse ETFs like DOG. This strategy means setting a percentage loss on DOG you're willing tolerate if the market keeps rising. A stop will automatically close your position once DOG hits your stop. Shah says he would use a 5% or 10% stop. Using a stop minimizes your losses while still giving you access to all the upside. 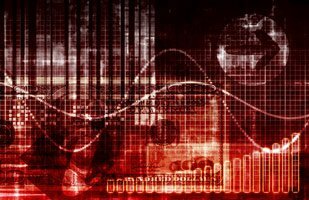 A stock market crash starts when traders panic during "catastrophic events, an economic crisis, or the collapse of a long-term speculative bubble," according to Investopedia. And a speculative bubble is exactly what led to the dot-com crash of 2000. After the Internet was commercialized in 1995, investors poured money into Internet stocks, even if the actual business behind the stock was unprofitable. Investors were speculating Internet companies would change the economy. The Unstoppable Trends are backed by trillions of dollars that Washington cannot derail, the Fed cannot meddle with, and Wall Street cannot hijack. There's no better example of this speculative betting than the rise of Pets.com, which held its IPO in 2000. The company raised $82 million during its IPO, but the Internet pet supply company was unprofitable. In 1999, the company only made $619,000, but it spent nearly $12 million on advertising. This sort of risky speculation drove stock prices to unsustainable heights. The tech-heavy Nasdaq soared 571% between 1995 and its pre-crash peak on March 10, 2000. When the tech bubble popped, the whole market fell. Pets.com stock collapsed from $14 a share to $0.22 a share by the end of 2000. Between March 2000 and the end of the crash in October 2002, the Nasdaq plummeted 77% as tech stocks plunged. And the tech stock crash dragged down the broader market too, as the Dow fell 36% in the same time period. But investors who didn't chase speculative positions and stuck to companies in the most in-demand sectors were protected from the worst of the crash. Some investors even profited during the tech stock crash of 2000. The trick to making huge profits is to find "must-have" companies that fall into what Keith Fitz-Gerald calls the six "Unstoppable Trends": medicine, technology, demographics, scarcity & allocation, energy, and war, terrorism & ugliness (known collectively as defense). The Unstoppable Trends are backed by trillions of dollars that Washington cannot derail, the Fed cannot meddle with, and Wall Street cannot hijack. Two of Keith's favorite Unstoppable Trend stocks are Raytheon Co. (NYSE: RTN) and Becton, Dickinson and Co. (NYSE: BDX). RTN and BDX are leaders in the Unstoppable Trends of defense and demographics, respectively. Raytheon is one of the leading defense contractors in the United States, with the third-largest contract portfolio of all defense contractors. Because defense is an ever-present need, Raytheon's services will always be in demand. Similarly, BDX provides medical supplies for hospitals and long-term care facilities. And because populations are always aging, Becton Dickinson's products are always in demand. 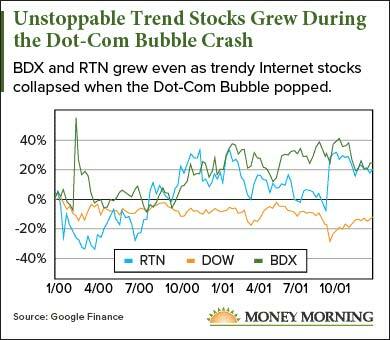 Check out how some of Keith's favorite Unstoppable Trend stocks fared during the dot-com crash in 2000 in the chart on the right. If you owned these companies during the dot-com bubble, you would have profited over 20%, even as the Dow fell 12% between 2000 and 2002. And RTN and BDX are still going strong. Dow's 9.7% gain on the year. Plus, Wall Street analysts are bullish on both companies going forward. Raytheon has one-year price targets as high as $192 a share, a 14% gain from today's price of $169 a share. BDX is forecasted to grow up to $230 a share in a year, also a 14% jump from today's $202 share price. On top of the forecasted growth for both companies, because they are consistently profitable and well-managed, they each pay a healthy dividend. Raytheon pays out $0.80 a share for a 1.89% yield, and Becton Dickinson pays out $0.73 a share for a 1.44% yield. That's added income for investors that can help pad a portfolio during a volatile market.